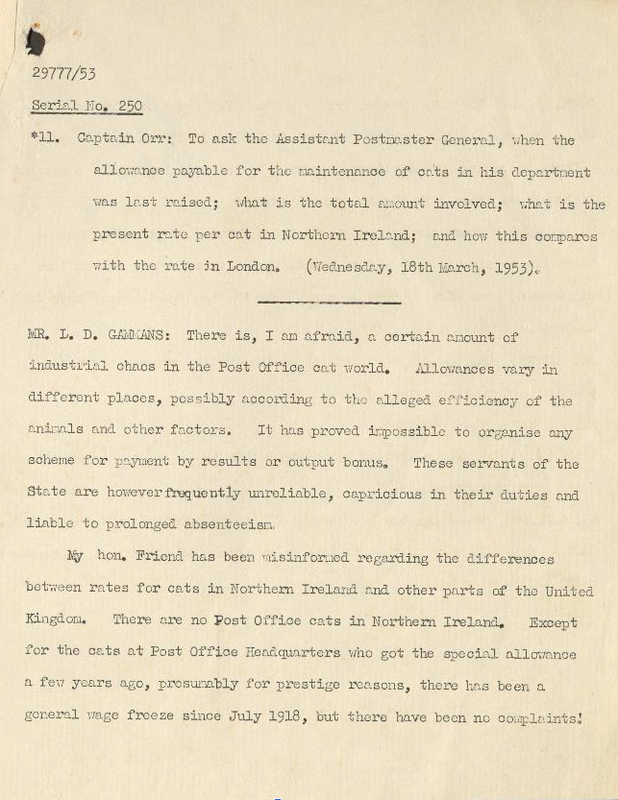 Cats were first officially appointed by the Post Office to catch rodents in September 1868 (although there had undoubtedly been cats in post offices before). Three cats worked on probation at the Money Order Office in London, with an allowance of one shilling a week. They were given 6 months by the Secretary of the Post Office to reduce the mouse problem or they would be cut. 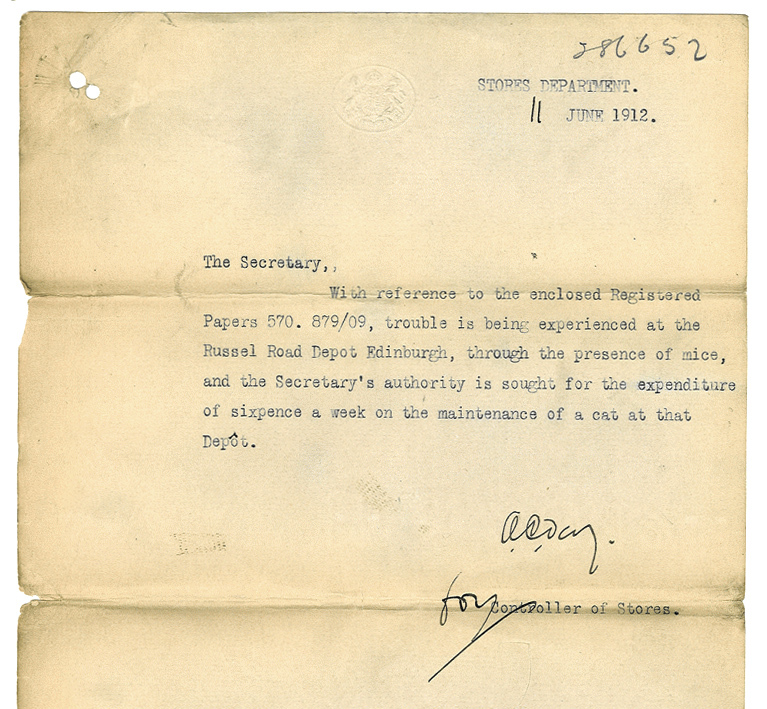 Luckily the cats did ‘their duty very efficiently’ and in 1873 they were awarded an increase of 6d per week. The official use of cats soon spread to other post offices with the cost of maintaining them varying. 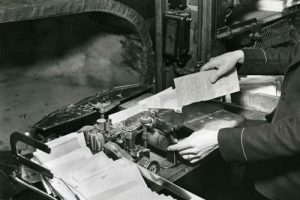 Right image: Typed minutes related to payment of Post Office Cats, March 1953. 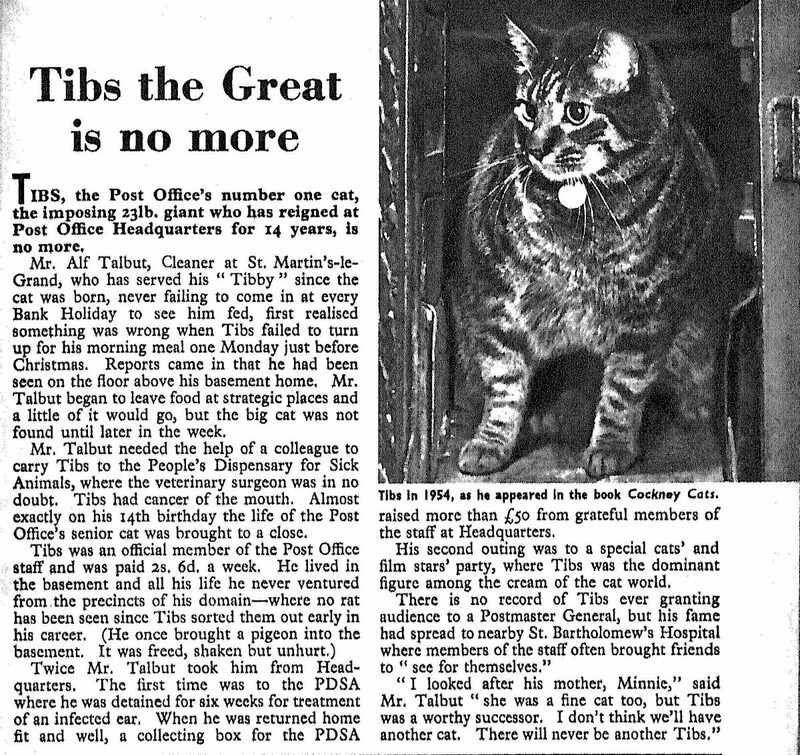 The most popular cat of all, however, was named Tibs the Post Office cat, who was born in November 1950. 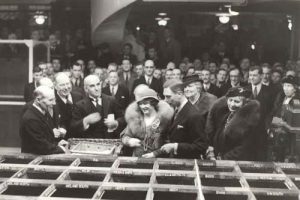 At his biggest, Tibs weighed 23lbs and lived in the Headquarters’ refreshment club in the basement of the building. 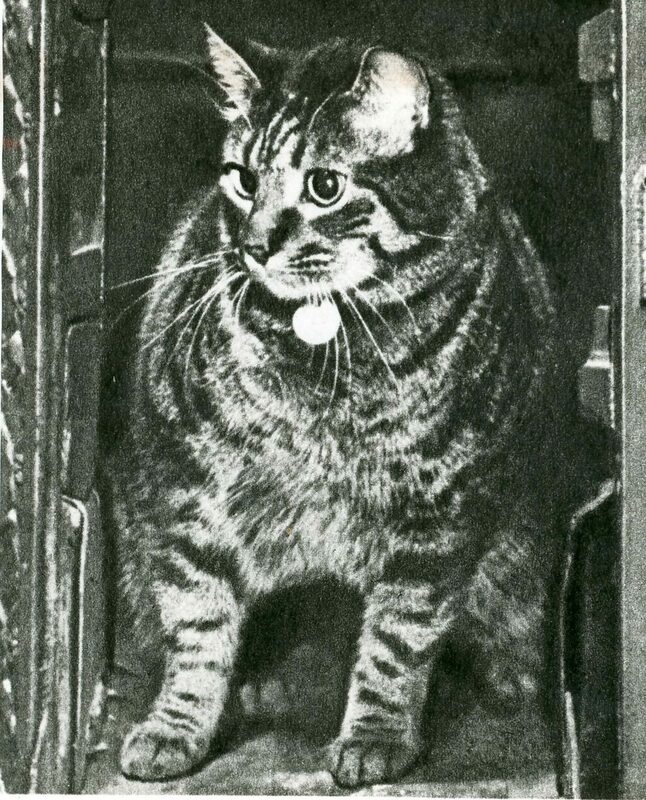 He not only kept Post Office Headquarters completely mouse-free during his 14 years’ service, but found time to appear at a ‘cats and film stars’ party and have his portrait included in a 1953 book Cockney Cats. Tibs worked diligently until his death in November 1964. 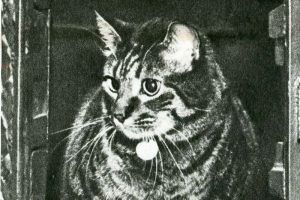 The last Post Office HQ cat, Blackie, died in June 1984, since when there have been no more cats employed at Post Office Headquarters. Obituary of Tibs the Post Office cat appearing in the Post Office magazine. Controversy has long raged as to whether mail was ever carried by dog cart. 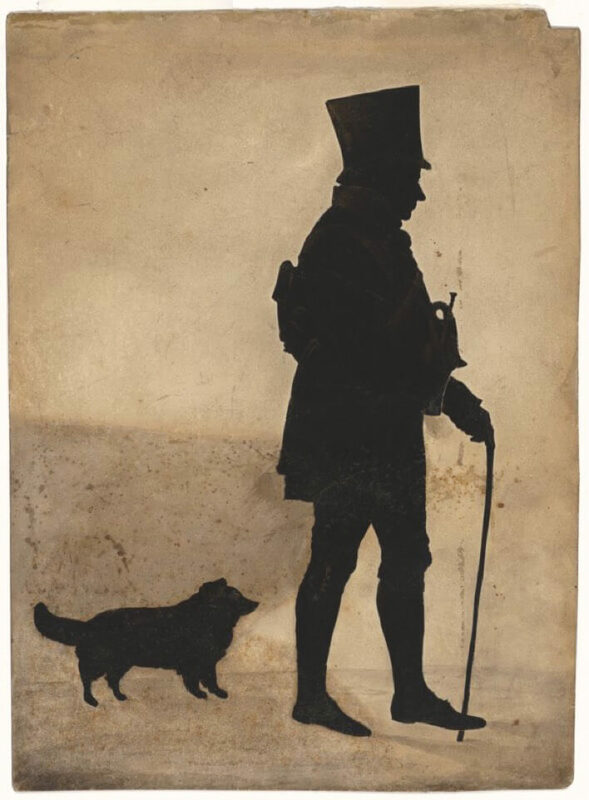 Legend has it that between 1830 and 1850, mail was conveyed between Chichester and Arundel, Sussex, in a cart drawn by four large dogs, and that this cart was once the victim of an attempted robbery by highwaymen. A letter in the April 1965 Post Office Magazine describes an unusual cart found in Swansea. 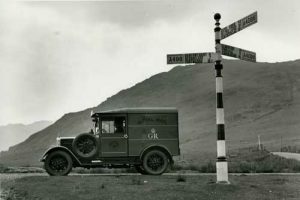 A plaque on it showed a coat of arms, the words “Royal Mail Cart”, the maker’s name (Simpson, Fawcett and Co., Leeds) and a patent number. 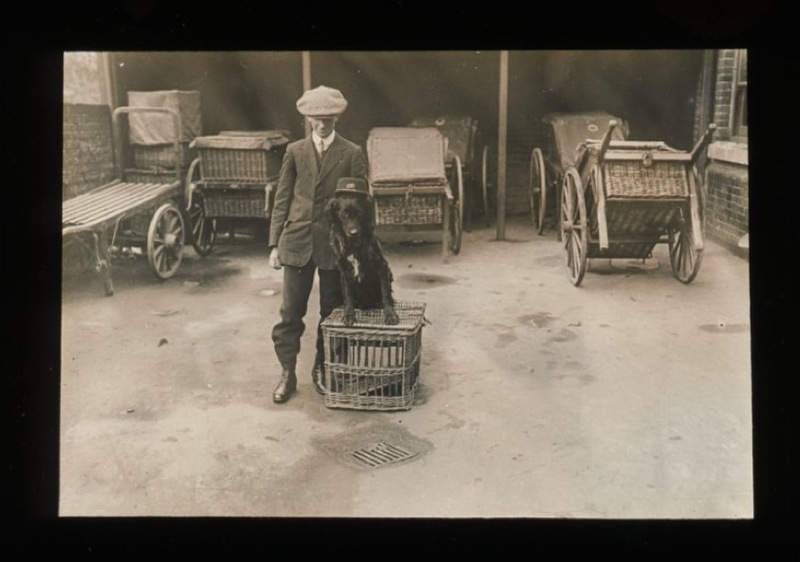 The company first appeared in a telephone directory in 1900-1901 and the patent number was confirmed as being issued for a dog cart. 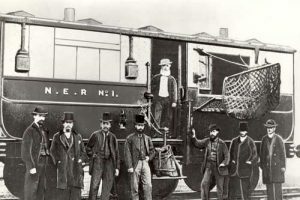 A “mail cart” had been authorised for bags sent on Sunday between Leeds and Cross Gates in 1903, so it was possible that the cart was bought and used by a contractor to The Post Office, even though the use of draught dogs was made illegal in 1855. 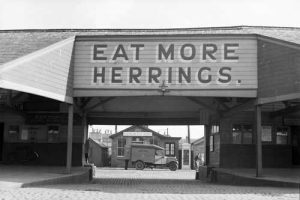 In 1939, during the building of The Post Office’s new transatlantic radiotelephone receiving station at Cooling Marshes, near Rochester, air began to leak through the cables connecting the 16 aerials to the station. As an experiment, a dog was used to detect the location of these leaks. 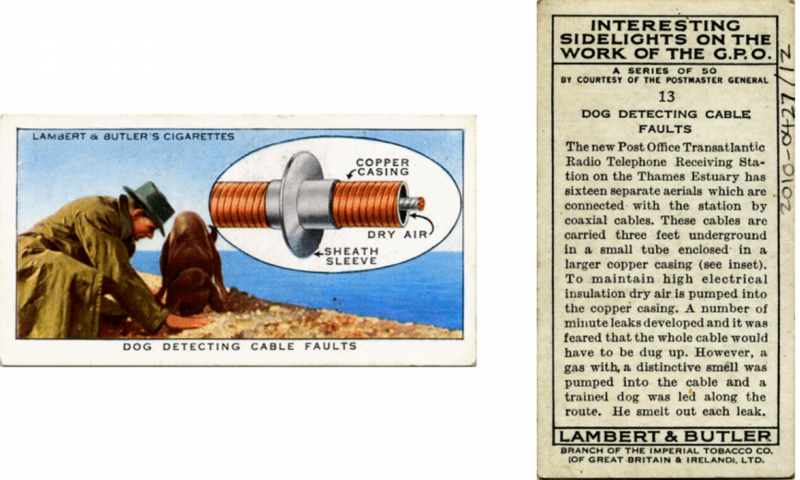 A Mr H S Lloyd, who trained dogs for the Home Office, brought along his Labrador retriever named Rex and a gas, which smelled strongly of cats, was added to the air pumped into the cable. Rex went along the route smelling out any leak three feet or so below the surface, and began to dig wherever he detected the smell of the gas. He found 14 leaks in total, which meant the cable could be repaired without digging up two miles of the cable route. 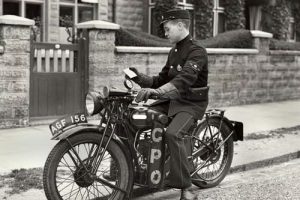 Horses have been used to carry messages from the very early days when they were “posted” at intervals on main roads so that messages from Court could be sent from London as swiftly as possible. In 1784, these reached speeds of up to 10 mph. The teams of horses were changed at inns every ten miles meaning that some routes required over 100 horses. 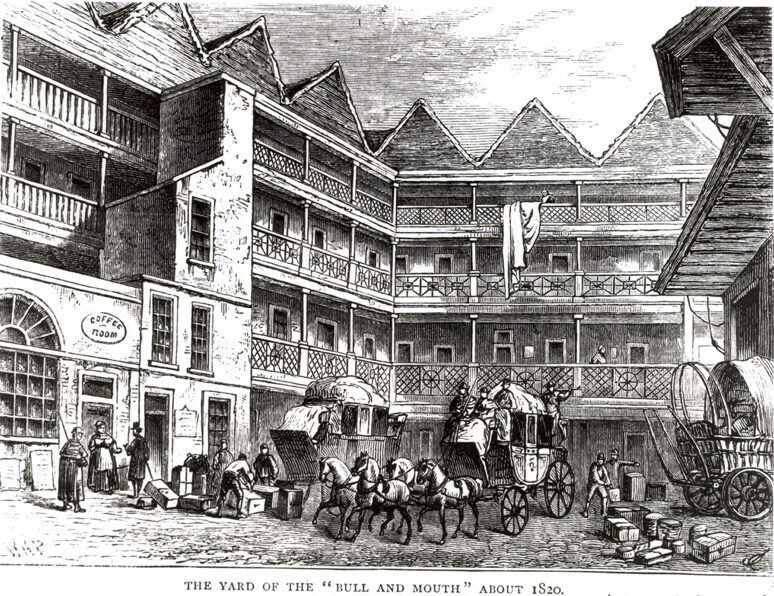 The vast underground cellars of the Bull & Mouth Inn, one of London’s principal coaching inns, served as stables for up to 200 horses at a time. 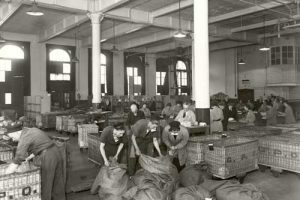 The horses were not employed by The Post Office but were provided by contractors. 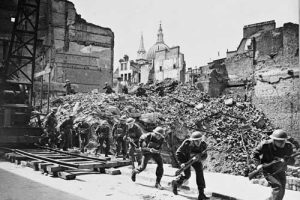 They were, however, entitled to sick leave. 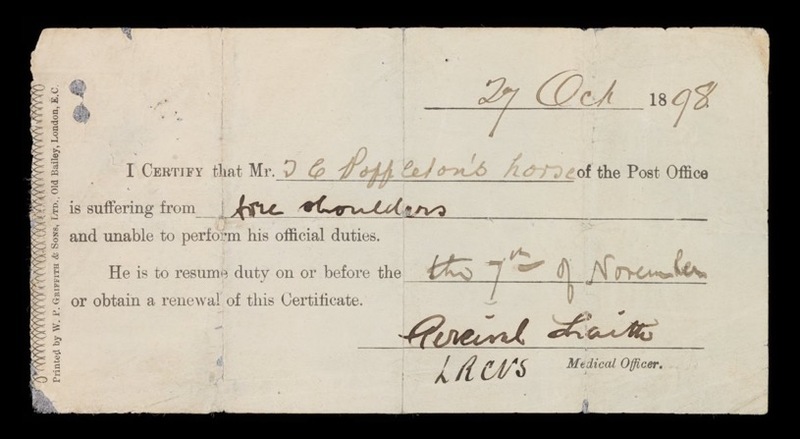 A note from 1898 states that “Mr T C Poppleton’s horse of The Post Office is suffering from sore shoulders and unable to perform his official duties”. 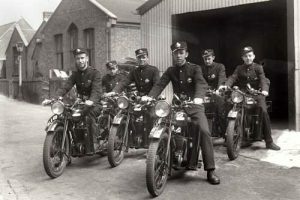 Horses continued to be used after the demise of the mail coach service to pull mail carts and vans, but by the late 1930s they had largely been replaced by motorised vehicles. 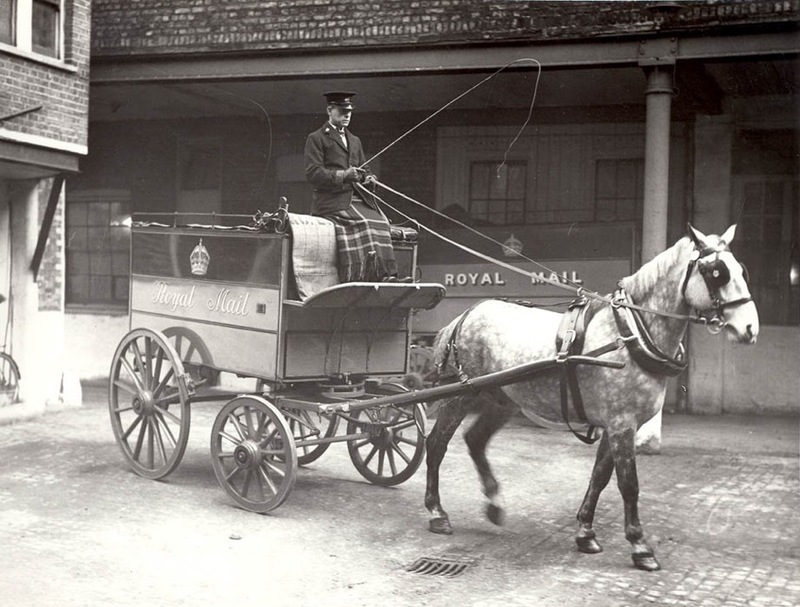 Horses were, however, used on a limited basis in remote areas and even London had a horse-drawn mail van until 1949. 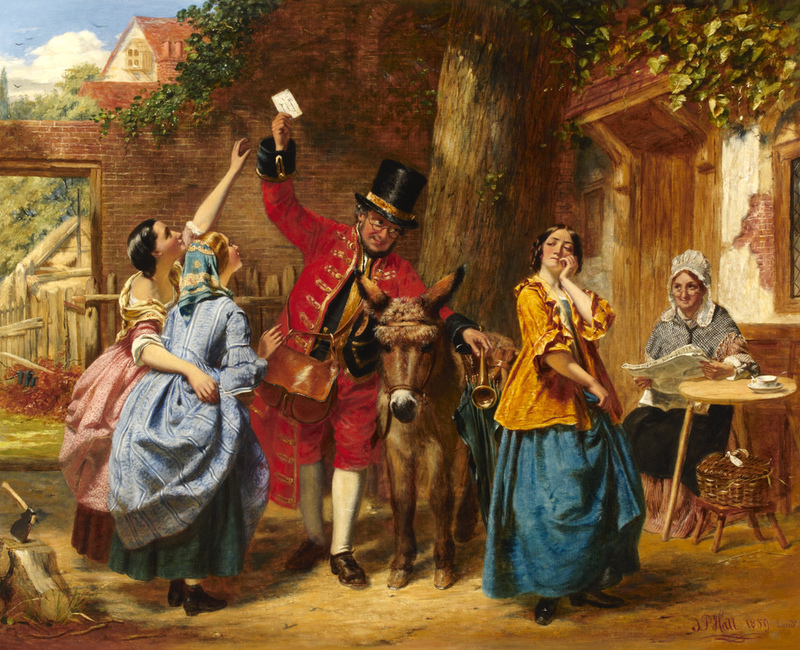 Mail has also been carried by donkeys, which were supplied by contractors to pull mail carts. A donkey was used, for example, to carry the mail up the very steep High Street in Clovelly, Devon.